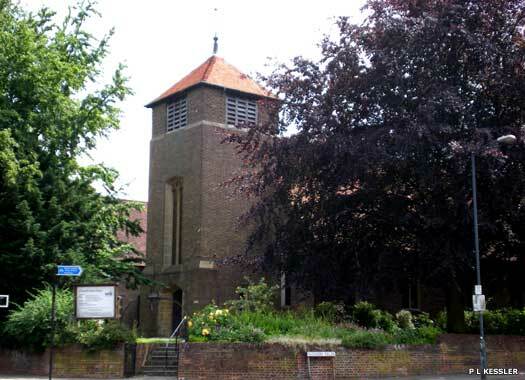 St Mary Bredin (New) Church sits on the south-west corner of Nunnery Fields and Old Dover Road, and is a replacement for the original wooden Old Church which was sited in Rose Lane. That church was built immediately after the Norman Conquest, with the name 'Bredin' being Saxon for 'boarded', to distinguish it from the other five churches dedicated to the Virgin Mary. The Norman stone church probably replaced an earlier Saxon wooden church. 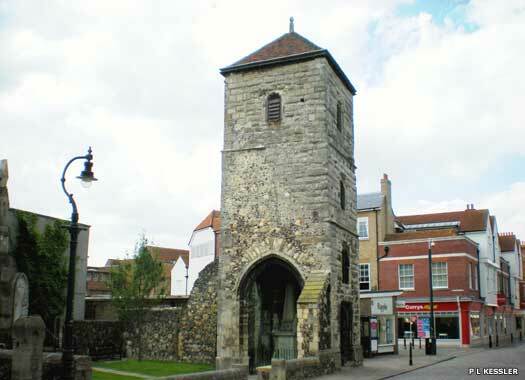 The Old Church inside Canterbury's city walls was destroyed by enemy bombing in 1942, along with a large southern swathe of the city. The ruins were quickly demolished, and all that could be rescued was the old collection plate, taken red hot from the ruins. A new church was needed, and the present brown-brick building was opened in 1957, with a church centre opening next to it in 1993 (on the far left here). The church was fully renovated between 2008-2009. 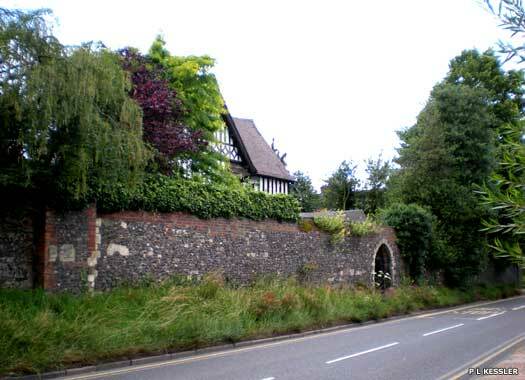 St Lawrence's Hospital stood to the south of Canterbury, with the only visible remains being this perimeter wall and gate on the south-western side of the Old Dover Road. The hospital was founded by Hugh, abbot of St Augustine's Abbey, in 1137, to treat leprous monks and poor relations of monks. Following the Dissolution, the site became a farm and then the present cricket ground. The hospital buildings would have stood in the car park opposite the Bat & Ball pub. 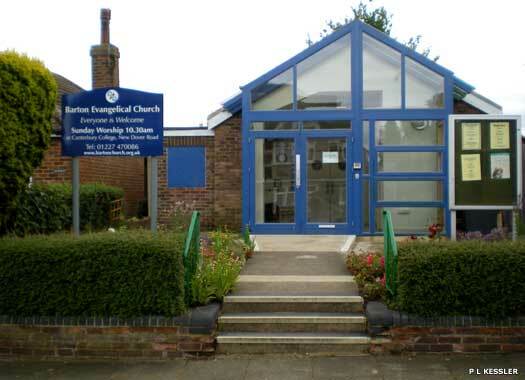 Barton Evangelical Church stands at 32 Barton Road, on the Barton Estate in Canterbury's southern suburbs. 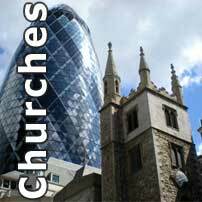 The church is probably a modern founding, with very little available history. 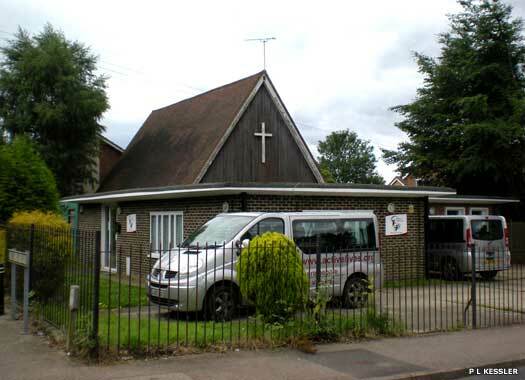 Around 2011, the official website stated that its two Sunday meetings were being held in the Chaucer School on Spring Lane, suggesting that Barton Road was no longer in use, but this might have been due to refurbishment work, which also explains the church's very new appearance. Bertha The Queen Mission Church is on the corner of Cumberland Avenue and Sussex Avenue on the Spring Lane Estate. 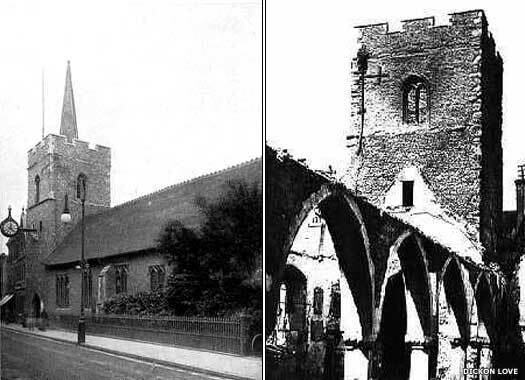 Its origins lay in the destruction of St George's Church in 1942 (see below). 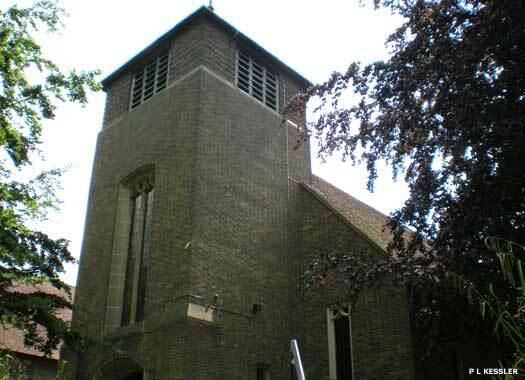 St George's parish was divided between St Martin and St Paul, and the sale of the land paid for Bertha The Queen. It was dedicated on 30 September 1961, but fell out of use in 1978. 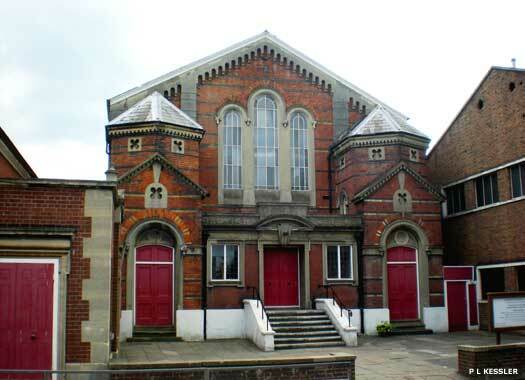 The building was purchased by the Canterbury Diocesan Association for the Deaf in 1981. Canterbury Baptist Church is on the busy St George's Place. To replace the failing Unitarian Baptist Chapel, on 16 June 1863 the foundation stone for the new Baptist chapel was laid by Sir S M Peto Bart, MP in the presence of a large crowd, and building work was handled by Mr H Wilson of Canterbury. The building opened for worship the following year, on Thursday 17 March 1864, and it came complete with a school and lecture hall (which is visible on the far left here). The Church of St George the Martyr stood on the southernmost part of St George's Street, although nothing now remains of it save the bell tower. 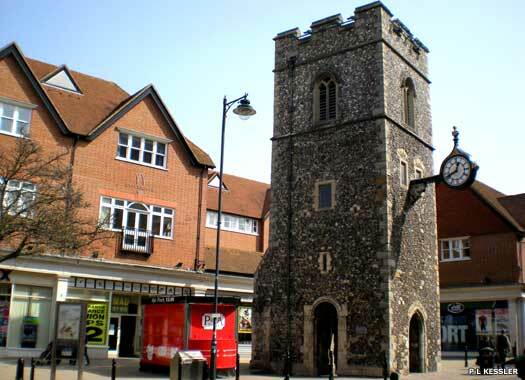 The church existed for over 900 years, with the nave stretching back to the right of the tower as seen here. The Tudor playwright, Christopher Marlowe (1564-1593), was born and lived in a house almost directly opposite the church for the first ten years of his life, and was baptised here on 26 February 1564. The site may have been occupied by a Saxon church at first, and a Norman church can be dated to before 1100. In 1871 its parish was united with that of St Mary Magdalene (see below), and the church was enlarged. On 1 June 1942, it was gutted by a German bombing raid which laid waste to much of the district (seen on the right). The bells partially melted and were later lost. The ruins were cleared in October 1952 and the tower was only just saved from demolition. Whitefriars Monastery occupied an area which was focused alongside St George's Church, with a main entrance on Rose Lane, and Lambert's Lane forming its northern boundary. The White Friars settled in Canterbury about1325, but by the time of the Dissolution they were was so poor that they petitioned the mayor for relief. Of the city's priories, this one has been the most fully erased. 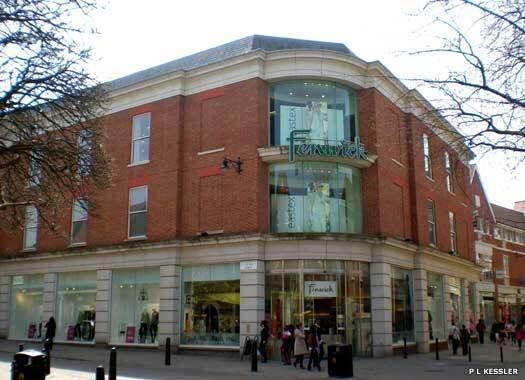 It now lies underneath the Whitefriars Centre (shown here). The remains of St Mary Magdalene stand in Burgate. The main church building was a thirteenth century construction, situated where the small garden is today, while the Perpendicular Gothic tower was built between 1502-1503. The parish was united with that of St George the Martyr in 1861, and the church was closed down five years later and demolished in 1871. Some of its columns and pillars were used to extend St George's, while the tower was fully restored in 1974. Two photos on this page contributed by Dickon Love and additional information provided by Tricia Baxter.